Rehearsals are well under way for GreenStage’s 30th season of FREE summer plays in the parks. We thought we’d give you a quick peek at some of the players. GreenStage photo by Jennifer Crooks. 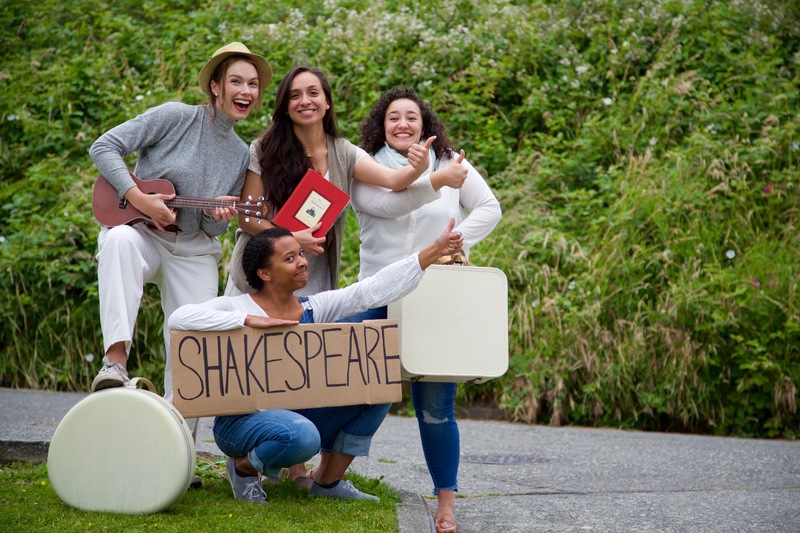 GreenStage casts are truly itinerant players, touring to more than 20 parks in the greater Seattle area each summer. At left our Backyard Bard cast thumbs a ride to its next gig! In front with the Shakespeare sign is Marena Kleinpeter; In back L-R: Jordan Kerbs, Ashley Salazar, and Mimi Santos. 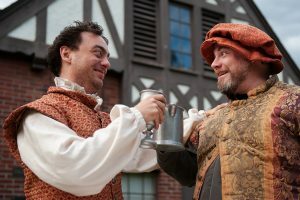 Backyard Bard plays are abbreviated versions of Shakespeare plays, usually about one hour each and using just four actors to portray all of the characters. This summer’s plays are The Two Gentlemen of Verona and The Winter’s Tale, both directed by Jennifer Crooks. Special bonus: Sundays are double-feature days, when you can see both plays for the price of one (free). GreenStage photo by Will Peterman. One of our full-length shows this summer is Henry IV, Part 1, directed by Amelia Meckler Bowers. Falstaff is something of a bad influence on Prince Hall, but we like him anyway. At right is Matt Gilbert (left) as Hal and Graham Pilato as Falstaff, toasting to good times down at the pub. Watch for pics from our other summer show, The Three Musketeers, directed by Erin Day, coming soon. It’s hard to get those folks to sit still long enough for a photograph, what with all of the constant dueling and such. Our season begins July 13. Go see a play!